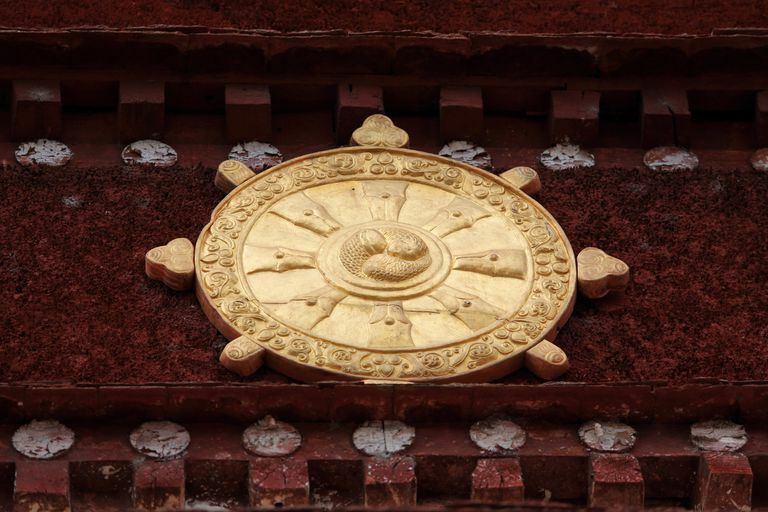 Dharma wheel in Tibetan monastery. The Buddha taught the Four Noble Truths in his first sermon after his enlightenment. He spent the remaining 45 or so years of his life elaborating on them, especially on the Fourth Noble Truth—the truth of magga, the path. It is said that when the Buddha first realized enlightenment, he had no intention of teaching. But upon reflection—in the myths, he was asked to teach by gods—he decided to teach to relieve the suffering of others. However, what could he teach? What he had realized was so outside of ordinary experience that there was no way to explain it. He didn't think anyone would understand him. So, instead, he taught people how to realize enlightenment themselves. The Buddha is sometimes compared to a physician treating a patient. The First Noble Truth diagnoses a disease. The Second Noble Truth explains the cause of the disease. The Third Noble Truth prescribes a remedy. And the Fourth Noble Truth is the treatment plan. Put another way, the first three Truths are the "what"; the Fourth Noble Truth is the "how." The Eightfold Path usually is presented as a list of things that are "right"—Right View, Right Intention, and so on. To our 21st-century ears, this can sound a bit Orwellian. The word translated as "right" is samyanc (Sanskrit) or samma (Pali). The word carries a connotation of "wise," "wholesome," "skillful" and "ideal." It also describes something that is complete and coherent. The word "right" should not be taken as a commandment, as in "do this, or you are wrong." The aspects of the path really are more like a physicians' prescription. The symbol of the Path is the eight-spoke dharma wheel, with each spoke representing an area of practice. As the wheel turns, who can say which spoke is the first and which the last? To practice the Path is to train in three areas of discipline: wisdom, ethical conduct, and mental discipline. Right View is also sometimes called Right Understanding. It is insight into the nature of things as they are, in particular insight into the first three Noble Truths—the nature of dukkha, the cause of dukkha, the cessation of dukkha. Right Intention is sometimes translated as Right Aspiration or Right Thought. This is an unselfish intention to realize enlightenment. You can call it a desire, but it is not a tanha or craving because there is no ego attachment and no desire for becoming or not-becoming attached to it. Right Speech is communicating in ways that promote harmony and understanding. It is speech that is truthful and free of malice. However, it doesn't mean being "nice" when unpleasant things must be said. Right Action is action that springs from compassion, without selfish attachment. This aspect of the Eightfold Path is connected to the Precepts. Right Effort or Right Diligence is the practice of developing wholesome qualities while releasing unwholesome qualities. Right Mindfulness is a whole-body-and-mind awareness of the present moment. Right Concentration is the part of the path associated with meditation. It is focusing all of one's mental faculties onto one physical or mental object and practicing the Four Absorptions, also called the Four Dhyanas (Sanskrit) or Four Jhanas (Pali). Not only did the Buddha spend 45 years giving instructions on the path, in the 25 centuries since there have been enough commentaries and instructions written about them to fill oceans. Understanding the "how" is not something that can be done by reading an article or even a couple of books. This is a path of exploration and discipline to be walked for the rest of one's life, and sometimes it will be hard and frustrating. And sometimes you may feel you have fallen off of it entirely. This is normal. Keep coming back to it, and every time you do your discipline will be stronger. It's common for people to meditate or practice mindfulness without giving much thought to the rest of the path. Certainly meditation and mindfulness by themselves can be very beneficial, but it's not the same thing as following the Buddha's path. The eight aspects of the path work together, and to strengthen one part means strengthening the other seven. "In this Eightfold Path, the eight elements work like eight legs supporting you. It is not like: 1, 2, 3, 4, 5, 6, 7, 8 on a linear scale; it is more of a working together. It is not that you develop panna first and then when you have panna, you can develop your sila; and once your sila is developed, then you will have samadhi. That is how we think, isn't it:'You have to have one, then two and then three.' As an actual realisation, developing the Eightfold Path is an experience in a moment, it is all one. All the parts are working as one strong development; it is not a linear process—we might think that way because we can only have one thought at a time."